This year our Annual “Children’s Festival” was organized with a lot of involvement with our new, dynamic group of youth volunteers from the local community, Iasmina, Dumitrita and Ana. Thirty children participated – some of them that are visiting their grandparents for the summer, and others that come regularly during the schoolyear. Also the children from Familia AMURTEL came every day. The volunteers organized a wide variety of activities, including: making a collective painting on a big canvas, weaving little potholders with bits of cloth, making bracelets, making flower pots, modelling with clay, playing games, ball, football. 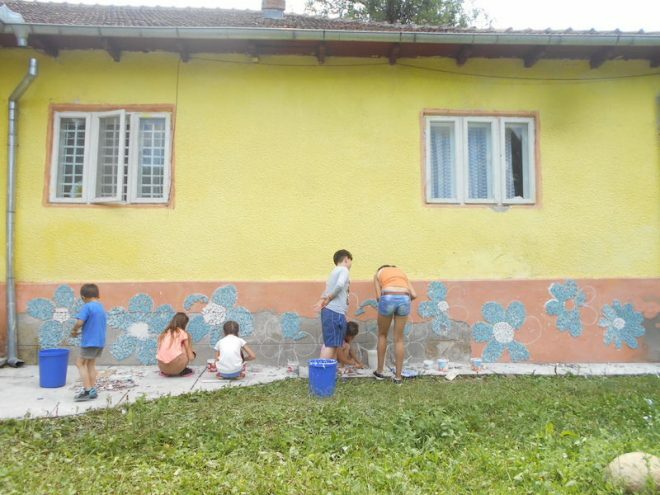 The children also made a mosaic of flowers using broken tiles on the exterior walls. The volunteers have also been helping us to prepare and freeze or make sauces and conserves for the winter from the abundance of green beans, peppers, zucchini, tomatoes, parsley and other vegetables and fruits that we receive from the AMURTEL Bio Garden.